Photon beams may be represented as a depth dose chart (along the central beam axis), a beam profile (perpendicular to the beam axis), or an isodose chart (a plane parallel or perpendicular to the beam axis). A chart showing dose along the central beam axis is known as a depth dose distribution. Dose is normalised to the point of maximum dose, zmax. The PDD is dependent on beam energy, field size, source-surface distance and is also affected by inhomogeneities. Electrons liberated through photoelectric and Compton scattering by 100 keV beams will have energies of about 20 - 30 keV and deposit this energy locally. This means that, unlike megavoltage beams, the depth dose chart will closely align with the attenuation of the primary beam and the kerma of the primary radiation. 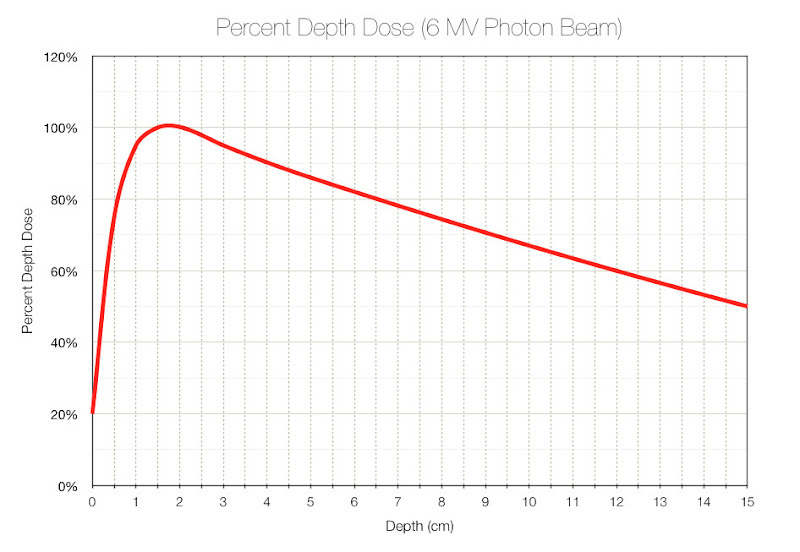 The keV beam is notable for maximum depth at the surface, and rapid falloff of dose as the beam is attenuated through photoelectric interactions. The ICRU guidelines state that the treated volume should have a dose variation of no less than +7% to -5%, so this beam is most useful for lesions that are only a few mm thick and lie on the surface. Most electrons liberated by 6 MV photons will have an energy of around 1- 2 MeV, but this varies from close to zero up to the maximum energy of the photon. Electrons with this energy will travel around 1 cm, explaining the buildup region of this photon beam. Once the depth of maximum dose is reached at 1.4 cm, the dose falls off gradually to 90% by 4 cm. It then continues to fall by about 10 % every 2.5 cm, the rate of dose fall off slowing after 9 cm. Electrons generated by 18 MV photons have mean energies of 2 - 6 MeV, explaining the increased buildup region for this beam when compared with 6 MV photons. 18 MV beams are attenuated more slowly, with the 90% isodose lying at 6.6 cm, and dose falling by 10% every 3 cm + 0.5 cm for every 10% under 80%. The central region which is usually flat and includes doses over 80% of the central beam axis. The penumbra region where dose falls off rapidly at the beam edge, between a dose of 20-80% of the central beam axis. Other distinctive features are the lateral horns, which are only present in photon beams (and more pronounced for 18 MV photons). The lateral horns are caused by the flattening filter, which aims for a flat dose at a particular depth. To create this, at depths above this point the beam has 'horns' of higher dose. Isodose charts are two dimensional representations of dose distribution. They are formed by lines drawn along equal increments of percent dose, relative to a particular point. For constant SSD techniques, ‘100% dose’ is taken as the depth of dose maximum on the central axis for a beam. For constant SAD (isocentric) techniques, ‘100% dose’ is the dose at the isocentre of the machine. Isodose charts represent a combination of the percent depth dose and the beam profile at multiple points along the central axis. Features such as zmax and the penumbra are visible. Most commonly, isodose charts are drawn on a plane parallel to the beam direction, but they may also be drawn on a plane perpendicular to the central axis. The width of the penumbra is about 1 cm. The entrance dose is the dose at the point where the beam intersects the patient or phantom. Kilovoltage x-rays have an entrance dose of 100% as they fall off rapidly thereafter. The surface dose of megavoltage x-rays reduces as beam energy increases and can be as little as 10-20% of zmax. Surface dose is due to a combination of primary radiation, scatter from the collimators and air, and backscatter from the treated volume. The exit dose is the dose at the point where the beam exits the patient. It shows a rapid fall off in absorbed dose due to lack of scatter from distant parts of the beam. Skin sparing is a phenomenon seen with megavoltage photon beams only. It is due to decreased entrance dose for these beams. The skin receives reduced dose than deeper seated tissues due to this. Skin sparing is one of the reasons for using megavoltage beams. Beam Flatness refers to variation in the beam strength across the central part of the beam. Within the central region, ratio of the dose over 90% to that under 90% is known as the uniformity index. The ICRU recommends that the uniformity index is kept above a value dependent on beam quality and field size. Dose in the central region should also be kept beneath 103% of the central axis dose. Beam Symmetry refers to the ratio of dose at a pair of points located opposite each other from the central beam axis. The AAPM recommends that the dose at these two points should vary by less than 2%. The geometric penumbra is due to a finite source size. It is more of a concern in teletherapy machines where the source is between 1 and 2 cm in size. The transmission penumbra is due to transmission of photons through the primary, secondary or tertiary collimators. The physical penumbra is due a combination of the geometric penumbra, transmission penumbra and electron scattering at the beam edges.